What is the most common material used for commercial or retail flooring? Concrete. Why? Because concrete provides businesses with so many benefits, it’s hard to believe businesses would ever consider any other flooring material. If you own a commercial property that doesn’t currently use concrete, here are a few reasons we think you should convert. And it’s not just because everyone else is doing it either. In an average home, foot traffic may consist of maybe 10 to 30 times a day. But how about in a restaurant or a hotel? That foot traffic can be multiplied by hundreds to even thousands, depending on the popularity and size of your business. With that much foot traffic, your average floor, such as tile or carpet, would quickly wear out. Concrete, however, is heavy duty and will last for decades rather than look decent for only a couple years. Plus, it won’t get nasty from spills, because it is easy to clean and won’t mold like carpet or tile cracks will. Since concrete flooring doesn’t have to be replaced nearly as often as other flooring materials, concrete ends up saying you money. Every few years you aren’t having to replace your floor, concrete has saved you money. Plus, if you’re wanting to replicate an expensive material such as marble, you can have the look without the repairs or the high initial cost. Concrete floors are also easy to maintain, which means your maintenance cost can go down. It requires no special upkeep. When you think of concrete, don’t picture a slab of gray concrete. Concrete can be so much more than that. With the use of a decorative concrete overlay, a logo or graphic, or a special stain, concrete can look beautiful, professional, and nothing like concrete. You can choose from having a simple style to stamping the concrete to look like wood or stain it to resemble marble or natural stone. Whether you’re a salon, hotel, restaurant, school, spa, or hospital, concrete floors can enhance your business and make it look clean and professional. In addition to flooring, we can also provide your business with a beautiful concrete storefront, patio, fireplace, and even walls. 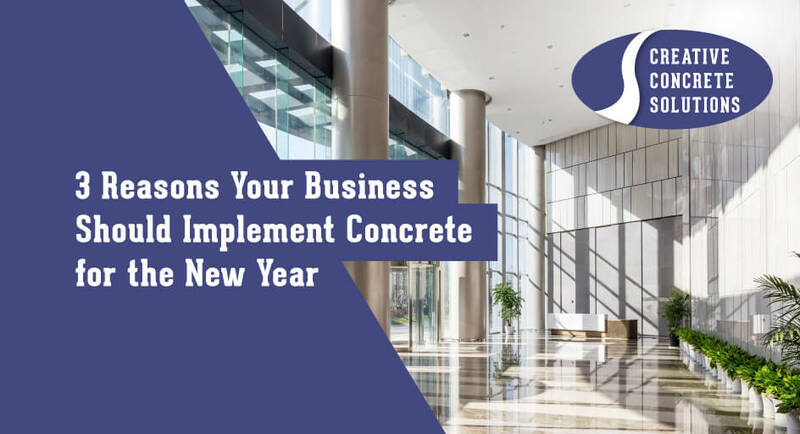 If your business could use some freshening up for the new year, consider hiring Creative Concrete Solutions to do the job for you!